Happy 4th of July! I’m running a holiday 5K this morning, but that’s no reason not to share the week. 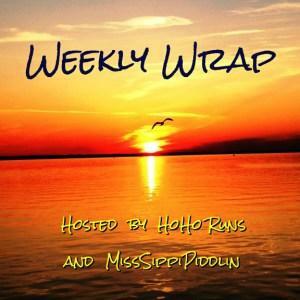 Let’s get to it with the Weekly Wrap with HoHo Runs and MissSippi Piddlin! This will probably be one of the slowest, lowest mileage weeks of the year, thus far. Little man had a play date with one of his friends, but it ended rather suddenly – he started complaining of a headache and wasn’t feeling well. We got him calmed and settled and as comfortable as we could. Mr PugRunner and I spent the evening watching Shark Week and the Game of Thrones Season Finale, and crossed our fingers for a better morning. Little man and I spent the day snuggling and watching movies. Since he wasn’t feeling much better and was starting to run a fever, we got an appointment for him the next day. He seemed ok with having to rest, even though he was missing camp. Between little man’s restlessness and checking on him throughout the night, and Mr PugRunner’s allergies, it was a rough night. I really wanted to bail on my group run, but I knew that I would regret it, so I sucked it up. I was really glad I did. And I was so glad that I got to wear my Raw Threads “Orlando With Love” racerback tank. It didn’t come in time for Saturday’s virtual, but I was proud to show it off on the waterfront. Mr PugRunner took care of the doctor’s appointment while I was at work. The results? Croup! Little man has never had croup, and we didn’t even realize older children could get it! He had been exhibiting a slight cough, so it seems like we caught it early (although the cough did get worse), so I was expecting strep or something more bronchial in nature. Diagnosis? Watch the fever, and let it run its course. Another day at home. Fortunately, my parents came by to keep us company and break up the day. And they brought us Chinese food for lunch, too! Little man’s appetite was off, understandably, all week, and he said he wanted some broth and plain lo mein, so we did our best to accommodate. And we also did our best to accommodate all the pugs’ demands for yummies. Sadly, it was another rough night: the theme of the week was truly sleep deprivation. I was incredibly exhausted, but again, I sucked it up for the group run. I didn’t have work scheduled for afterwards, so I knew I could crash after a shower. However, my heart wasn’t in it and I had to bail at three miles instead of four. and spend time with these lovelies. Also, I got to love on a couple of pugs who were visiting the area. They were so adorable! After a shower, it was back to lazy days for all of us. My parents came over again to spend the day with little man so we could both go to work. It was a busy day and the late afternoon storms led to a ton of traffic on the home commute. Not a fan of traffic in the least. Mr PugRunner grilled salmon, shrimp and scallops for a delicious seafood dinner for the whole family. It was just what we all needed. I was dreading the heck out of this long run. In fact, I almost talked myself out of it. When I woke up, I had a nasty cramp behind my hip (not the previously injured one) and I just didn’t want to go. Mr PugRunner wanted to go for a bike ride, so I was working against the clock, too. At the end of five miles, I was near home so I stopped for a drink and a potty break. Mr PugRunner was still working on his coffee and told me that I could finish the last two. I said I would do one more, but then realized I would be pretty disappointed in myself if I didn’t just do the whole damn thing. Little man is on the mend. We have had a string of fever-free days and he is very much over being under the weather. Hopefully, we can get back to our regularly scheduled summer this week. I was pretty bummed to miss out on some cycling and body circuit, but the 30 Day Challenges are giving me some strength workouts in the meantime. I didn’t supplement with any videos at home, just because I’ve been tired from some very sleepless nights. I figure that a light week here or there is far better than getting sick because I’ve run myself down. This week, I don’t think I’ll be back at body circuit due to some other obligations, but I will continue my challenges, my running and my cycling and make up for it all that way. Isn’t amazing how one event can throw off your whole mojo? When Matthew broke his leg, that pretty much sucked the wind out of my sails. I’m still recovering from that. I’ve been really tired lately. Glad your little guy is feeling better! Hopefully next week will be back to normal for you! Seriously. I am still exhausted. And it’s just devastating that there’s nothing I can do to fix it for him. Ugh. This week is just a little more calm, for which I am very grateful. The sunrise runs are my happy place, for sure. Hope you had a great 4th too! Hope you had a great race yesterday and that it helped to make up for the stressful and long week. Thank you! It was really good to get out, even if it was stupid hot and the race started late. Good for you for mustering on despite the sleepless nights. Hope Little Man is back to his old self asap! I’ve been on autopilot and am quite ready to drop! Sorry to hear that your son’s been sick with croup! I’ve never even heard of that, glad he is on the mend. It would have been so easy for you to skip your runs, but you pushed through…great job! Croup is a nasty jerk. It’s been a pretty miserable experience for all of us, and I hope we never have to deal with it again. I ran a 5K too on July 4th! You look great in the t-shirt! I did not know any kids got the croup anymore- I hope the little man is feeling back to normal!